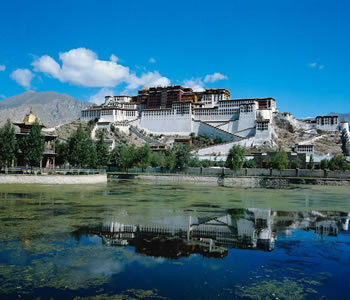 Located in Lhasa City of the Tibet Autonomous Region, and first constructed in the 7th century, the Potala Palace is the most comprehensive art treasure house of cultural relics in Tibetan area of China. Towering upon the Moburi Mountain in the Lhasa valley, the Palace is world renowned for its magnificence and exquisiteness. A serpentine stairway up the mountainside leads to the palace buildings on a height of 3,700 meters above sea level. Its stone-and-wood main building has 13 stories, measuring 110 meters in elevation. his bride, the Tang Dynasty Princess Wencheng. 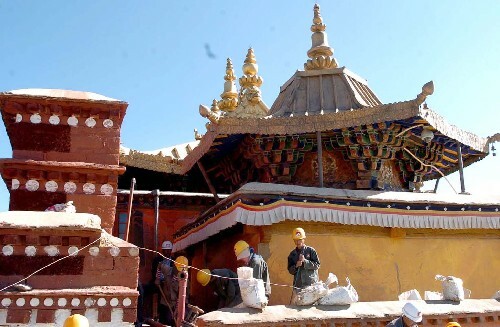 When the Tibetan Kingdom was in its prime period, for the friendship between the Tibetan and the Han nationalities, and to welcome Princess Wencheng into Tibet, Songtsan Gambo ordered the construction of the Palace. It had 999 rooms, plus the red tower on the mountain top, one thousand rooms in all. Since then, houses began to appear as living quarters in addition to tents. The pious followers of Buddhism regarded the towering Palace on top of the mountain as "The Polala Mountain," the sacred place of Buddhism, hence the name of the Palace. The mammoth and solemn Palace is composed of the White Palace and Red Palace. The former is for politics and daily life of Dalai Lama. 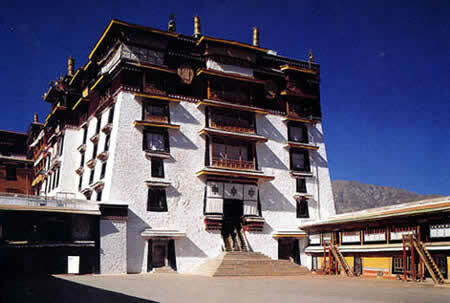 The latter comprises halls housing sturpa-tombs of successive Dalai Lamas and various Buddhist halls. The Grand Hall of the Red Palace, consists of dozens of Buddhist halls, scripture halls and mourning halls, connecting with each other by painted corridors and staircases. The Buddhist Halls enshrine the statues painted in gold of Sakyamuni and deceased Dalai Lamas. A great amount of ancient scriptures are stored in the Scripture Halls. The mourning halls house the sturpa-tombs of 13 Dalai Lamas. All the halls are full of streamers elaborately embroidered with scriptures and incantations. Above the statues of Buddha are hung colorful ribbons. The air is thick with smoke of burning incenses offered by Buddhist believers. Hundreds of butter lamps burn day and night. Most fascinating about the Potala Palace are the Buddhist statues of various size made of copper, gold or silver, which are unique and exquisite in shape, excellent in craftsmanship, and lifelike. Some of them have a height of several meters, and some, only a few inches. There are at least over 200 thousand statures in all. Museum" filled with dazzling array of paintings. The Art Gallery on the second floor of Sixipingcuo Tower alone contains 698 mural paintings. According to the autobiography of Dalai Lama of the fifth generation, the creation of Potala murals was started in 1648 A. D. by 63 painters from various parts of Tibet and completed 10 years later. Over the past 300 years or more, the original murals have undergone several renovations and a number of new murals have been added. Their contents cover a broad spectrum of Buddhist life, and the unique land, custom, history and episodes of Tibet. Tibetan painters are adept in applying colors of sharp contrast to depict varied and colorful images, and have reached extremely high artistic realm. Some of the mural paintings measure 5-6 meters high and a few score of meters long. Usually several hundred paintings are grouped together in a magnificent and kaleidoscopic endless array. Mounting the top of the Potala Palace, one has a bird's eye view of the various cupolas sparking under the brilliant sunrays, the distant surrounding mountains with rivers flowing through, and the ancient Lhasa City.